Contract catering and hospitality specialist BaxterStorey has appointed Mack Allan as its South West and Wales managing director as it seeks to strengthen its presence in the region. The national group already has a significant local client base, including Nationwide building society’s HQ in Swindon, law firm Burges Salmon’s Bristol head office and the Office for National Statistics in Newport. Since taking on his new role, Mack, pictured, has already overseen the opening of the company’s new regional office in Bristol, from which he aims to develop a stronger presence in the region. Mack began his career as a chef in the armed forces and progressed into management at British Aerospace (now BAE Systems) at Filton, landing his first operations manager role covering the wider Bristol area. 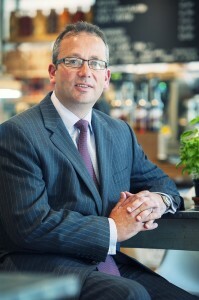 He joined BaxterStorey in 2000 and has progressed through various leadership roles in Reading, London and, most recently, as regional director for Scotland. Mack said: “The South West and Wales is a strong growth area and we have some fantastic clients here. My role is to nurture these relationships and set us up for the next stage in our growth across this thriving region. “Contract catering has moved on so much since I joined the industry and it is now recognised that businesses like BaxterStorey take pride in providing their clients with high-quality, fresh, local and seasonal ingredients. BaxterStorey provides bespoke hospitality services through restaurants, café bars, deli operations and executive dining rooms for a wide range of customers. It employs more than 8,500 people at 700-plus locations. It is part of Westbury Street Holdings, which also owns Searcys, the prestigious catering firm that provides hospitality at iconic, exclusive venues for hire throughout the UK.